I was pretty impressed with the Ridekick child trailer, but it’s still a prototype so you can’t buy it yet. 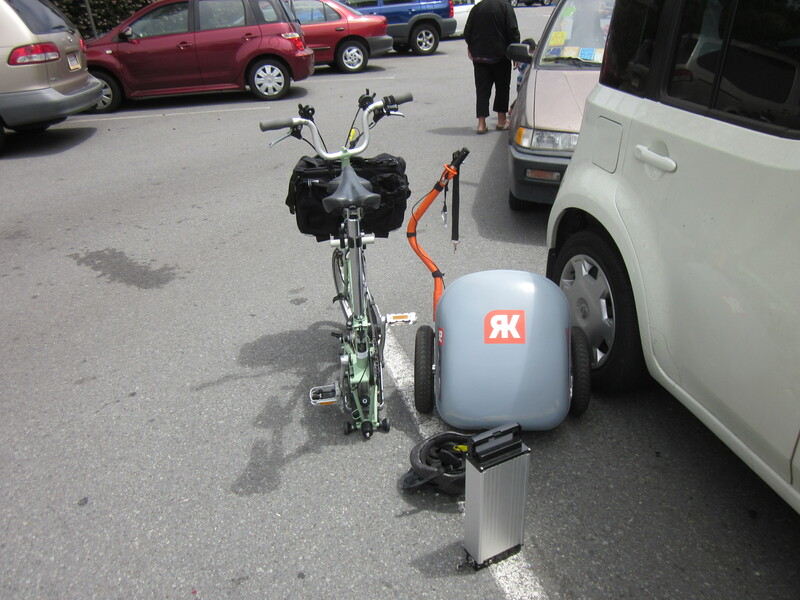 However I did recently get to try the Ridekick cargo trailer, which anyone can buy right now. I originally started looking at an assisted trailer as a possible way of getting around the city when I was just back to weight-bearing and much weaker. I had hopes that the San Francisco Bicycle Coalition offered one of them as a membership benefit—they do have other trailers for members to use. But no such luck. However Ridekick was willing to drop one off and let us use it for a while, which was absolutely fabulous of them. The appeal for me of an assisted trailer was that it was a temporary solution to my problems getting around by bike while I figured out how much strength I’d get back in the longer term. Other people, I suspect, are interested in an assisted trailer for different reasons. My sense after riding with both trailers and assisted trailers is that they are a product for people who need to haul loads sometimes. 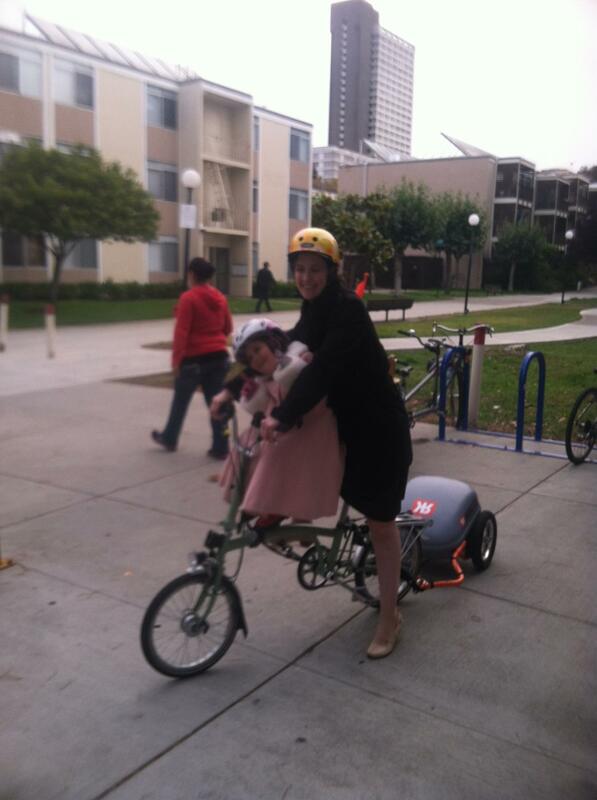 If you are riding with your kids every single day and rarely ride without them, it probably makes more sense to jump right to a cargo bike or assisted cargo bike. It is more fun to ride with the kids on the bike, in cities with a lot of traffic it feels safer to ride with the kids on the bike, and some of the logistical issues with the trailer, like the fact that it can be a pain to park, go away. But if money is tight or if there are a lot of pickup and drop-off swaps between parents, then a child trailer makes a lot of sense. And if you are hauling a bunch of tools or equipment every day then you don’t need me to tell you to consider a Bikes At Work trailer or a cargo trike or whatever. If you’re looking at an (assisted) cargo trailer, maybe you have a fast and light bike but want to do major grocery shopping on the weekends, or have a long commute and want to bring a week’s worth of clean clothes on Monday and haul them back on Friday. For that kind of thing, it doesn’t necessarily make sense to add a rear rack, and a trailer will probably carry more anyway. Some people will view hauling an unassisted trailer as strength training and other people not so much. If not so much, the Ridekick cargo trailer is worth a look. It made heavy loads disappear. One day I packed it up with over a dozen hardback library books and then bought milk and yogurt (in glass bottles) and some other groceries. Starting to pull a load like that in the trailer nearly yanked my little folding bike backwards, but a push from the assist made riding normal again. We live on a fairly substantial hill, yet I had no fears about making it home. The Ridekick trailer works with any bike! I had never seriously considered putting an assist on my Brompton, as that would make it too heavy to carry, and I got a folding bike specifically for times I needed to actually take a bike places I couldn’t ride one. But putting the Ridekick trailer on the Brompton was no problem. I wish that these trailers were more available as rentals because they’re also a great way to try out riding with an assist—not being able to imagine what an assist feels like and to judge whether it is worth it seems to be a real sticking point for people who are considering one. I think that is very understandable given the price and hassle of installing electric assist on a bicycle. I have tried a throttle assist on bicycles (the Yuba elMundo) and it wasn’t my favorite, but I may not have given it enough time because the throttle assist on the Ridekick really grew on me. As a weaker rider it was really nice to feel like I could push the throttle to the max and get pulled up the hill when I needed that. The throttle itself is a push toggle and it’s quite sensitive. By pushing it lightly I could keep the assist low enough that I actually felt like my pedaling was adding something. In practice because I was trying to build strength I tended to max the assist when I was fading and catch my breath, then let it go and use the momentum the bike had gained to pedal part of the way on my own again. This got me up quite a few big hills that I couldn’t have done solo, let alone with a kid on board (I usually have a kid on board). I suspect that a lot of people could use the Ridekick this way: to build up strength. For regular use I still prefer a pedal assist but for occasional use the throttle makes a lot of sense. By comparison to a decent assisted bicycle, the Ridekick cargo trailer is pretty cost-effective at $700. Yes, there are big box store style e-bikes that sell for $500 but they are junk—they have very limited range, weigh as much as boat anchors, and have batteries that will die within a few months and can’t be replaced. The Ridekick has a lot more useful life than that. It’s not useful in all the ways that an assisted bicycle would be, but for many people’s needs, an assisted bicycle would be overkill. Probably my biggest problem with the cargo trailer was that I had the chance to try the child trailer first. I liked the child trailer much better, even as a way to haul cargo. The cargo trailer is much smaller, capable of holding a couple of bags of groceries. The child trailer could haul a couple of bags of groceries AND two seven year olds, or several bags of groceries and one kid, or a giant pile of donations to Goodwill. I kept thinking of the cargo version as a single person’s trailer. It wasn’t right for the volume of stuff that I wanted to carry. I don’t think I’m the target market for this trailer. All trailers, including the Ridekick, can be tricky to park. It’s actually a lot smaller than child trailers, so it wasn’t that big a deal, but at the racks at my office, for example, I had to scoot it around a little to make sure it wasn’t hanging out into the car parking places where it might get run over. The battery is in the body of the trailer itself, which is fine and makes sense given that batteries are heavy, but unfortunately that means there is no way to tell how much charge is left without stopping to open the trailer. So I had a fair bit of range anxiety at the end of the day when I was riding with it. This turned out not to be justified at any point, because its range was actually pretty generous—I rack up about 10 miles up and down some major hills just going to and from work and dropping off and picking up a kid or two—and I never actually ran the battery down despite using it, especially at the beginning, pretty profligately. However I never knew how much power was left until I stopped riding, and that made me edgy. This was particularly the case because at the time my limp was so pronounced that I had a lot of trouble walking my bike up hills. I did not like the attachment for the trailer. It screws on using a plate attached through the rear axle, which is pretty traditional for trailers. My sense was that it was both too easy and too hard to release. It was too easy because there after a couple of weeks the trailer fell off the bike while I was riding—in regular use, you need to tighten the screw regularly. FYI. It was too hard because if the screw was tightened appropriately, you needed tools to take it off. Given that the market for this trailer is almost certainly an occasional user, I felt like it should work like the Burley Travoy, which has a snap-in attachment that can be operated by hand. The wiring for the assist, interestingly, worked just that simply. To remove the assist wiring from the bike you only needed to pull out the plug, and to reattach it to push the plug back in. I wanted the trailer itself to attach and release that easily. An issue that I suspect is more Ridekick’s problem than mine is that everyone who saw me seemed to think the trailer was homemade. People told me it was very cool and then asked me how I’d put it together, which ha ha. I suspect that the Ridekick cargo trailer would sell better if it looked a little more professional, somehow. This is the market that I’m pretty sure the Burley Travoy is targeting—the ride to work on Monday with a bunch of work clothes in the bag and return with the trailer full of dirty clothes on Friday set. Or maybe the Ridekick just needs a bigger logo. In neon colors. I don’t know. So the Ridekick cargo trailer: pretty cool although it’s not quite right for us (the child trailer, on the other hand, I want for traveling). The Ridekick is the only assist I know of that you can use with a Brompton and still have the ability to lift the bike up by hand. Probably the greatest thrill of riding with the Ridekick attached was being able to take my Brompton anywhere with a kid on board. Getting it up the hill where we live was simply impossible for me for most of last year, if not to this day. 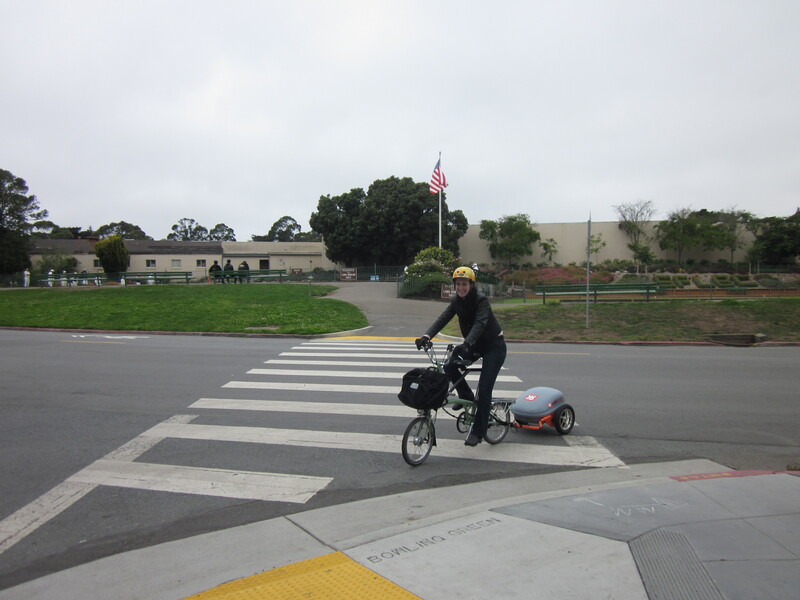 The commutes with the Brompton+Ridekick were some of the most memorable I’ve taken all year because I had such great conversations with my kids during those rides. On one trip home my son (almost 8 years old and still fitting on the Brompton front child seat!) relayed me the entire plot of a series of Avengers comic books, which although it did not really interest me at all, was exciting because he was so excited about it. On another trip my daughter taught me some of the Japanese songs she learned at preschool. I love carrying my kids on that seat more than any other bike seat, but the Brompton gets less use than I’d like because of the hill. With the Ridekick cargo trailer, I could carry them and all our stuff and not have to worry about any of that. “Make it go fast!” they yell when we got to a hill. And I could. Have you seen the Mac-Ride seat on Kickstarter? Looks like a promising front seat solution. I read about it on Family Ride. It looks interesting, similar to the Wee-Ride Kangaroo. How realistic is using the IT (pere?) seat with a brompton when a kid is 5 or 6? I know you do it and you mention you can still fit your 8-year old but I’m not sure how practical it would be for a daily commute of about 2 to 3 miles each way. Our son is pretty average size (height and weight) for his age. If we think we can likely use it for the 5 to 6 year old year at least then I think we’d probably go for it. Otherwise we’ll use our dummy for a longer route that doesn’t involve Caltrain. Thanks for the help! I wouldn’t have a problem with it personally. I carried my son to his summer camp when he was 6-7, about 3 miles each way, without any major issues other than having to buy him a new helmet with a smooth back. Helmets with a sharp edge at the back will cut your chin. On the other hand, if you are short and your kid is tall it could be uncomfortable. And eventually having to turn your legs out can bother some people.